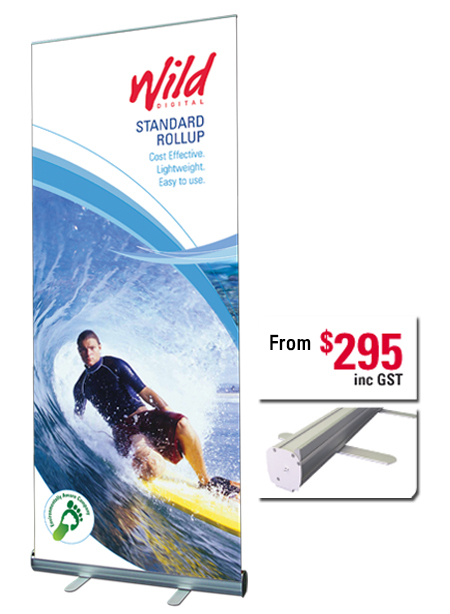 Wild Digital - Standard rollup - retractable pull-up bannerstand. The standard rollup bannerstand is a fantastic and cost-effective way to market your product or business. Standard rollups are lightweight and portable displays that make a very big impact. These retractable bannerstands are ideal for promotional messages and point of sale displays. The standard rollup can be set up in 30 seconds. It is available in a range of sizes. The Standard Rollup uses a single roller mechanism to retract the graphic into the base unit. The graphic is safely stored and protected in the base. The graphic is printed directly onto a synthetic substrate with UV stable inks. Lamination isn’t required reducing both the cost and the environmental impact. Replacement graphics are available for all rollup banners. You can reuse the base for a long time. Rollups come with a 10 year manufacturers warranty. Rollup bags are not included in the warranty. Sizes: 845mm wide by 2100mm high.600mm, 1000, 1200mm and 1500mm wide rollups are also available. Price: From $295 (inc GST).